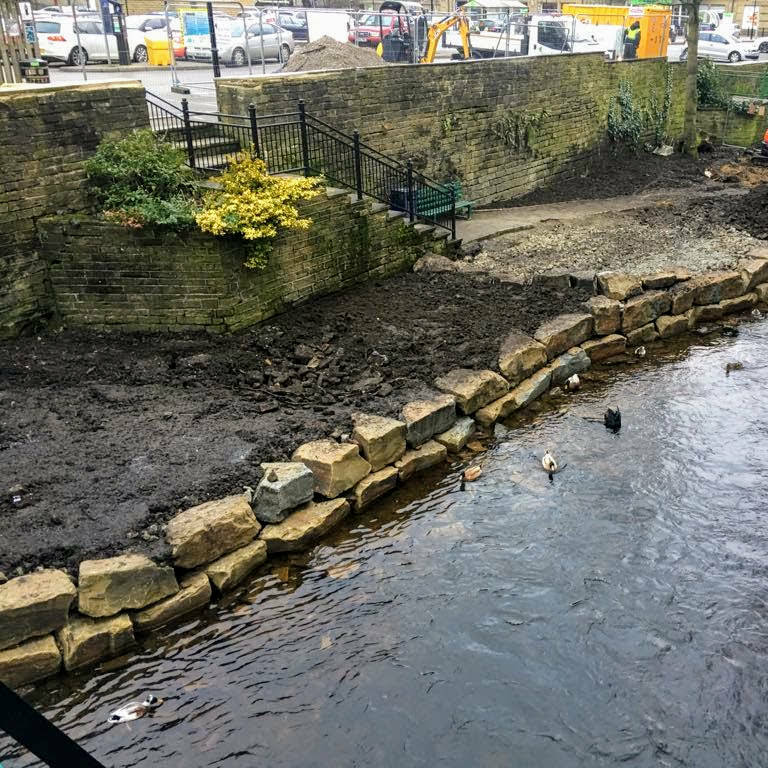 Boulders and Gabions used as a river defence - River Holme, Holmfirth. 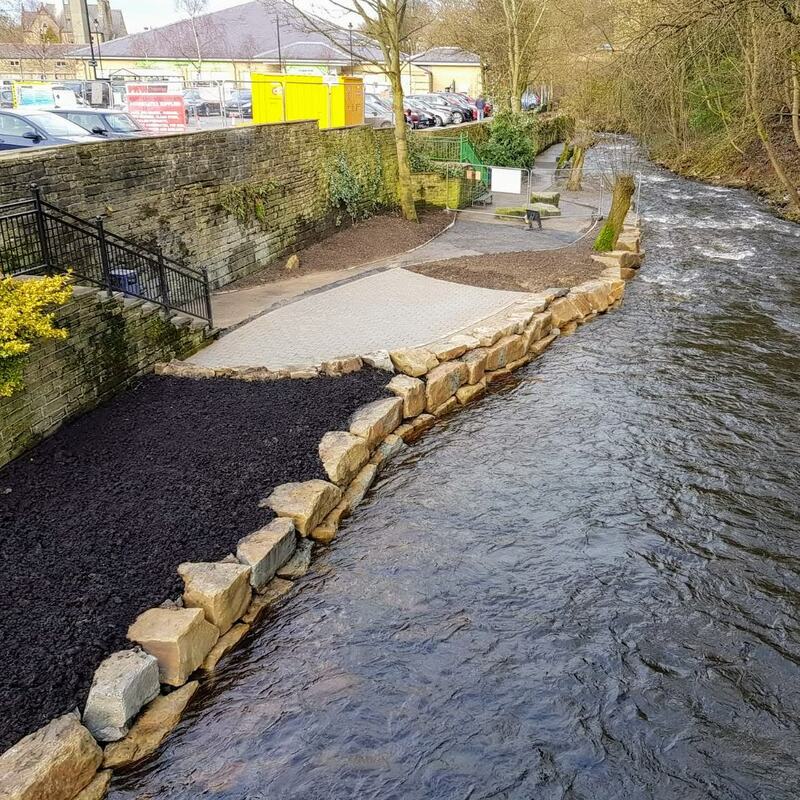 Boulders & Gabions used as a river defence – River Holme. 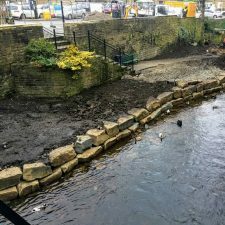 The Duck Feeding Area, Crown Bottom Car Park, Holmfirth Co-op, River Holme. 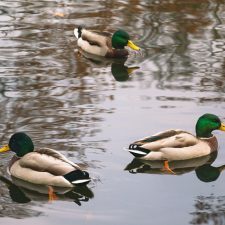 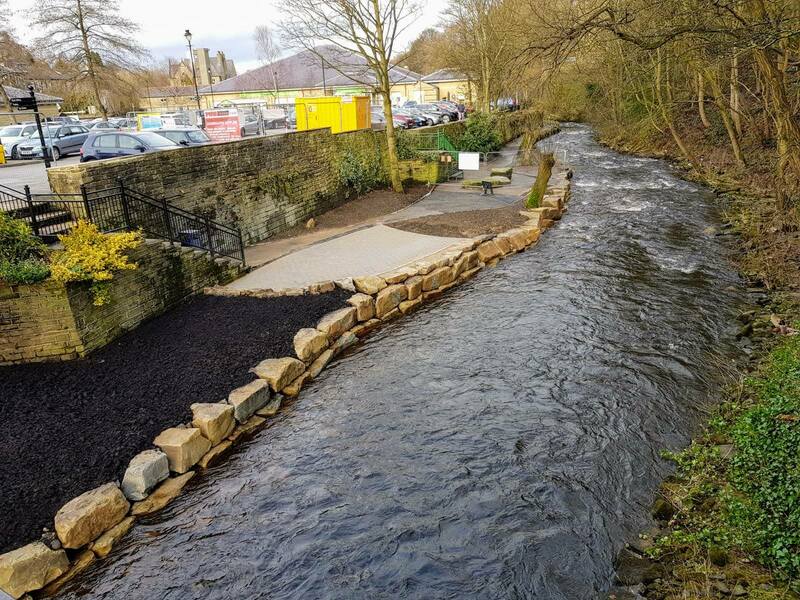 During January a project to reconstruct the riverbank duck feeding area on the River Holme in Holmfirth was completed. This is one of only a few places in Holmfirth where the river can be accessed and it’s popularity has meant the area has been worn down over the years from the feet of many a duck feeder. 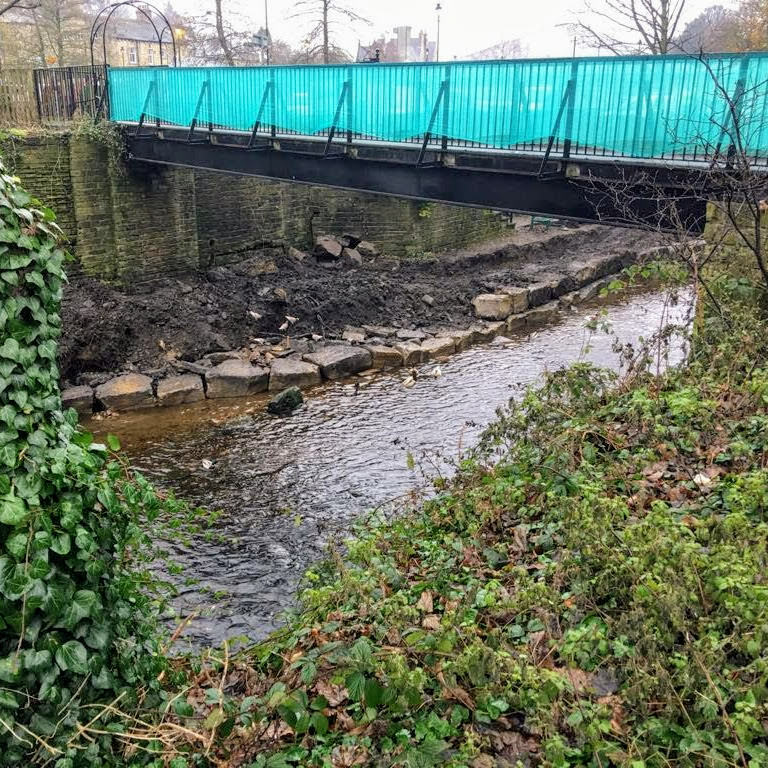 The project was initially started in December with the area being cleared which made way for some heavy duty foundations. 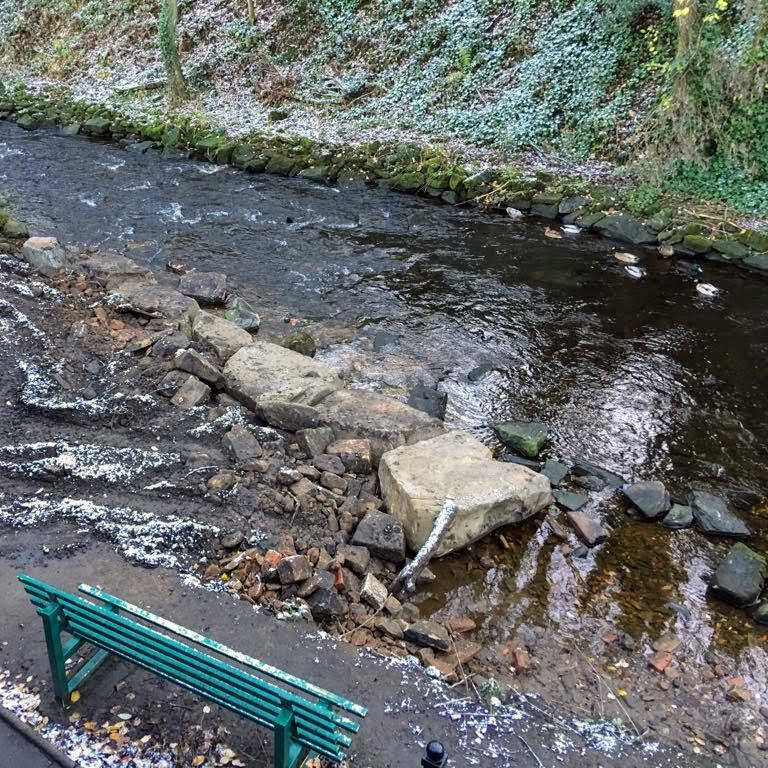 These were constructed to withstand higher water levels and protect against further erosion of the riverbank. 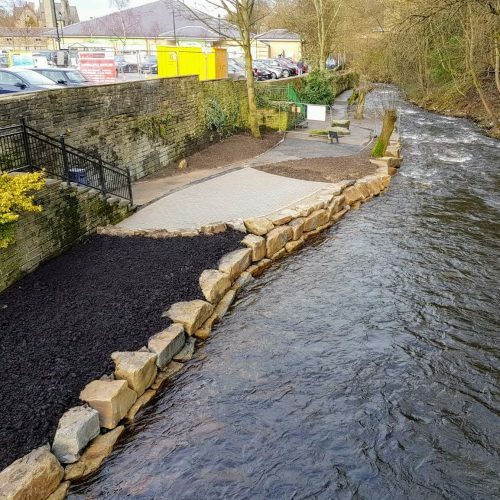 A new paved pedestrian area was laid on top which improves access for anybody using a wheelchair or buggy. 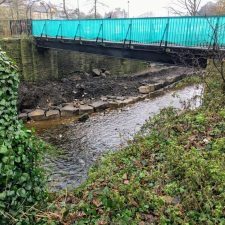 Different plants will also be introduced to increase the biodiversity of the area. 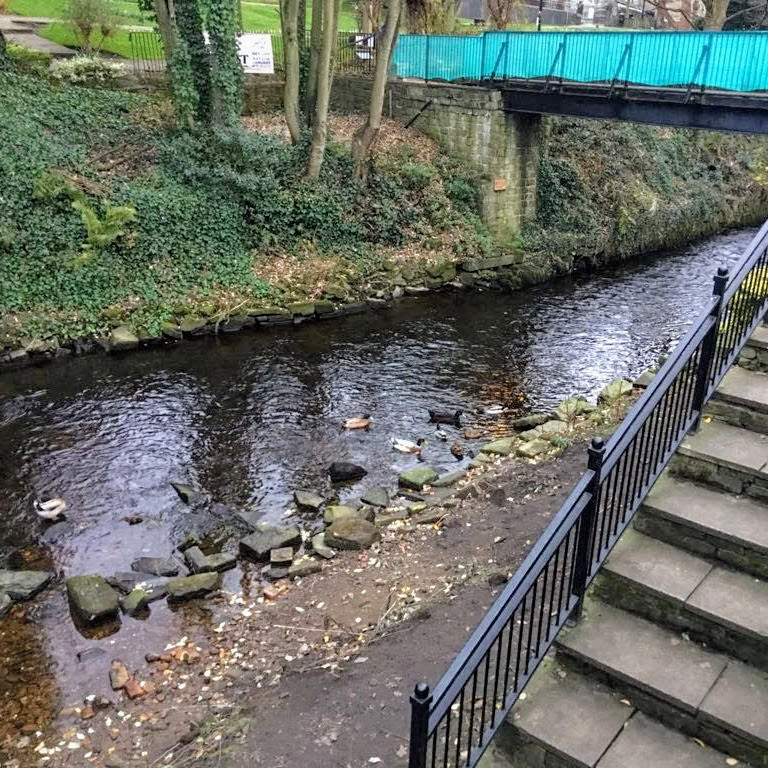 To let more light reach the riverbank the surrounding trees have been cut back and pruned. 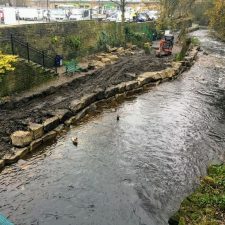 The work was co-designed and led by River Holme Connections in response to community feedback. 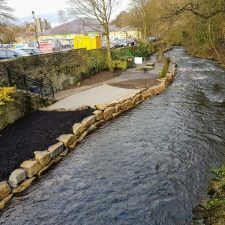 They were supported by Kirklees council and the appointed contractor Garry Scott Groundworks. River Holme Connections are dedicated to making improvements along the full stretch of the River Holme to protect the water environment for the benefit of people, wildlife and businesses. 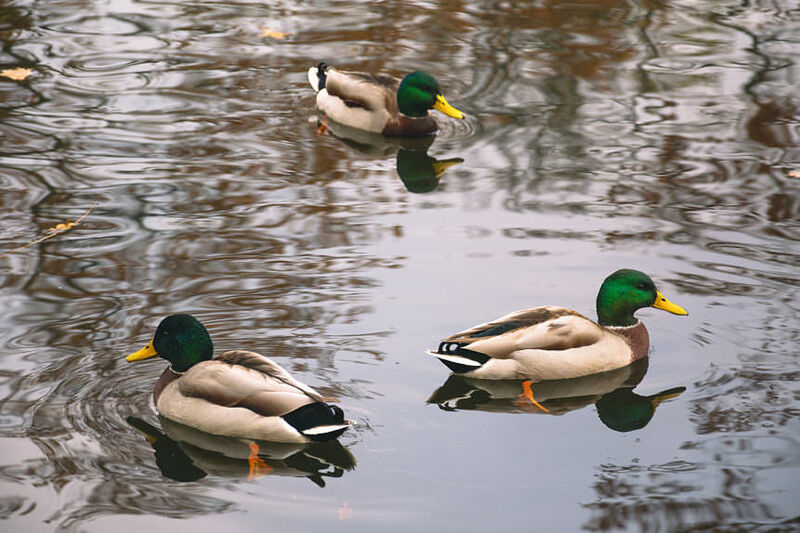 Their next project is just down the river at the Sands Recreation Area. 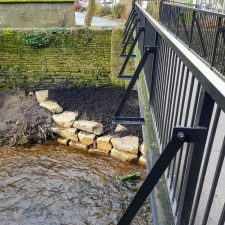 You can read more about the work they do protecting the water environment on their website River Holme Connections. 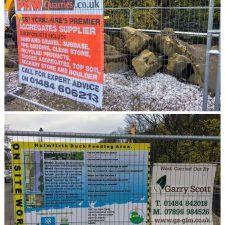 Materials supplied by PMW Quarries. 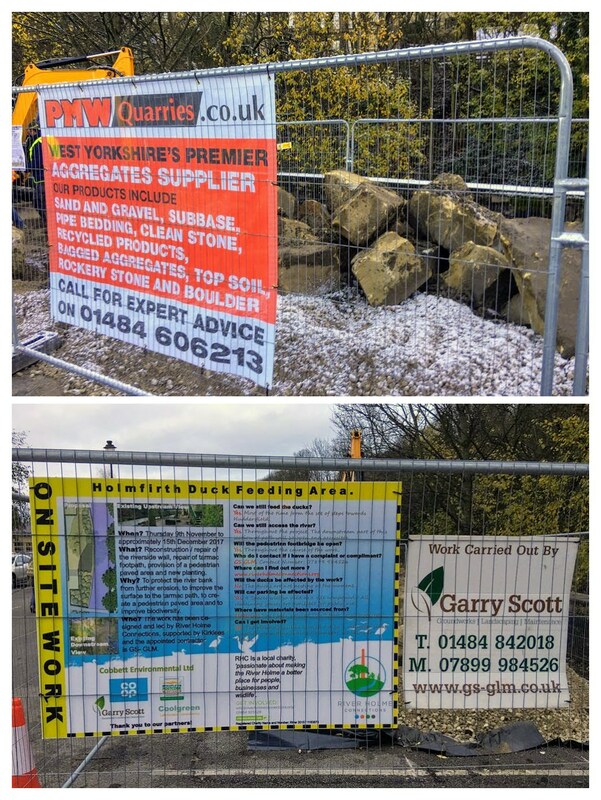 PMW Quarries were very pleased to work with Garry to source and deliver the right stone for the project. 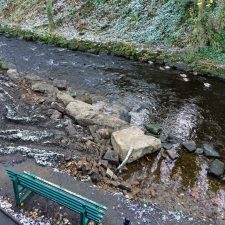 A mixture of boulders and stone graded between 100/200mm were used to build up the foundations of the banking and river wall. 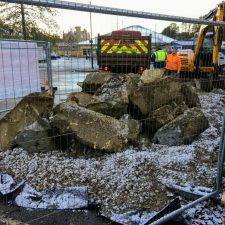 The boulders are heavy enough to resist the water flow throughout the year and the stone was placed in wire mesh gabion mattresses to ensure they stay in place. 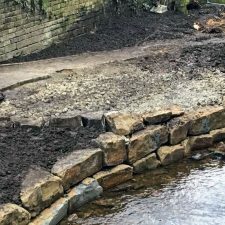 The stone used was a quarried, locally sourced gritstone which is hard wearing and has an angular shape. 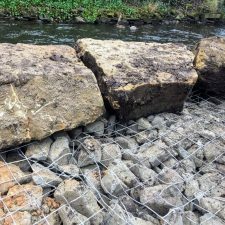 The more angular the gabion mattress fill, the better the interlock of the stone within the mattress. This reduces movement of the stone under water flow or wave action which prevents erosion of the riverbank. 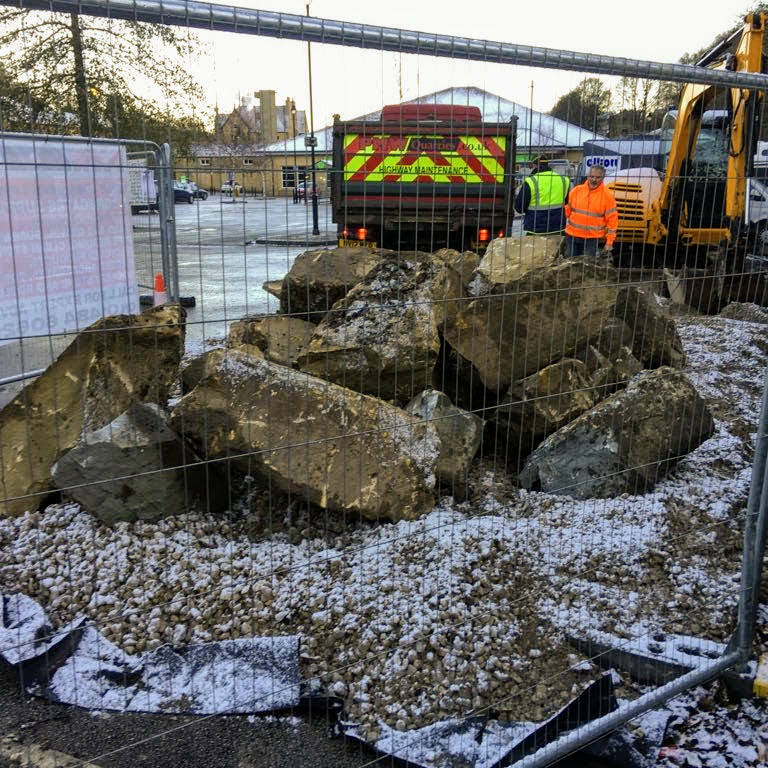 The boulders were pecked into shape at our local yard, Carr Hill Quarry. 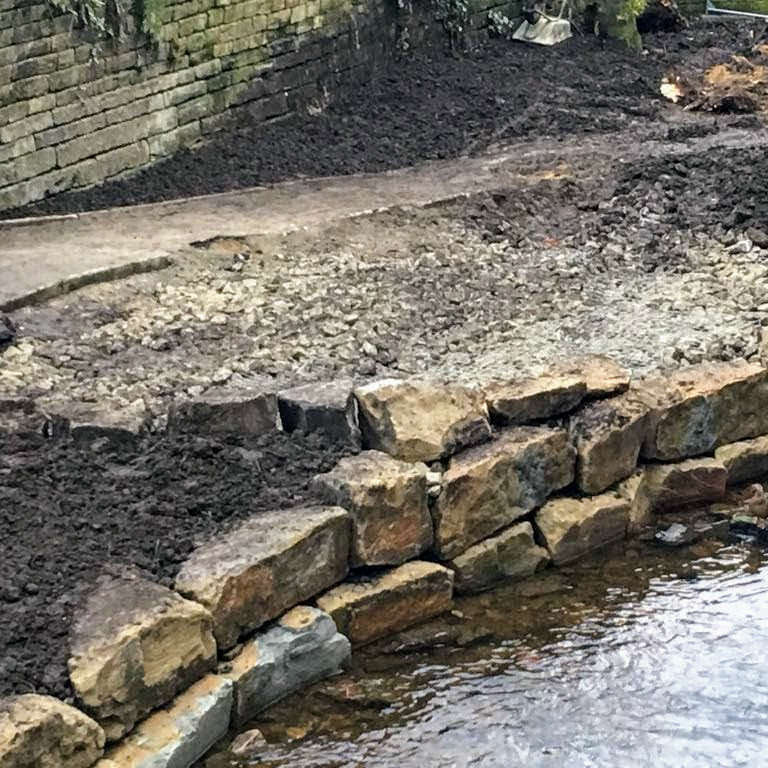 As they were stacked to form a wall, a flat edge was needed, in addition holes were drilled through the rock and steel rods inserted to link the boulders together. 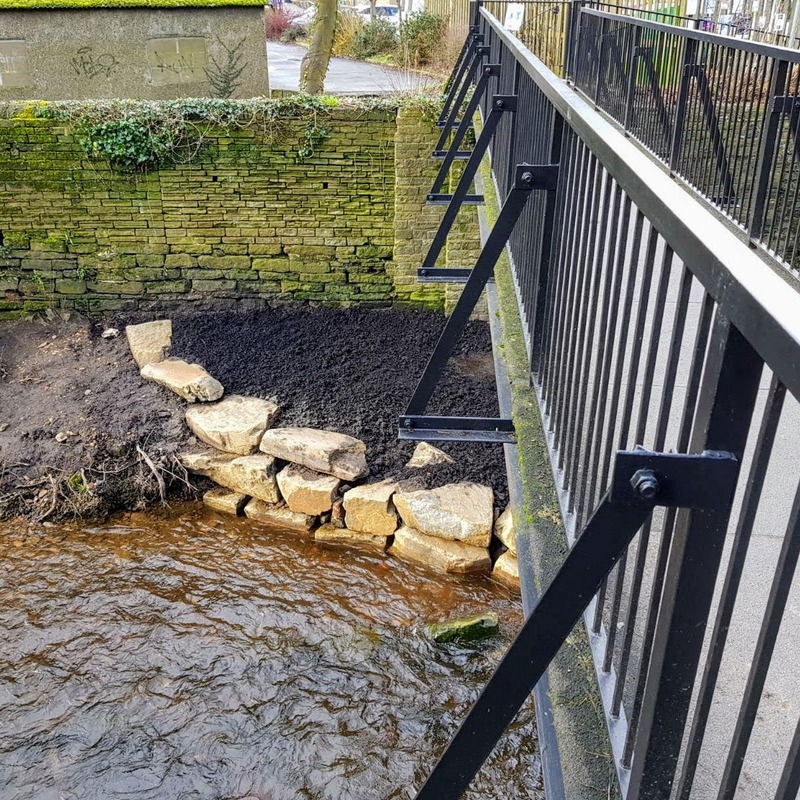 This minimises any movement of the wall which would contribute to erosion.